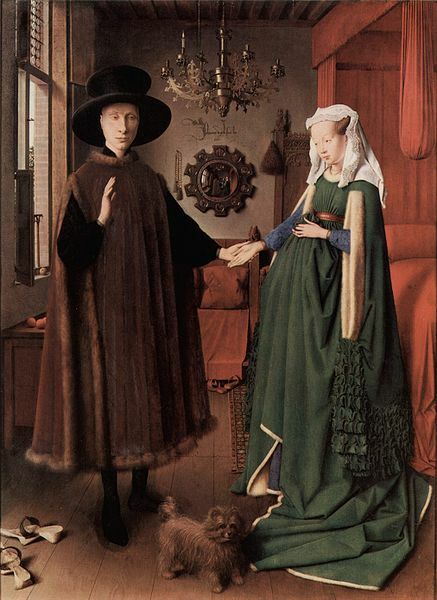 The Arnolfini Marriage, also known as The Arnolfini Portrait (among a few other names) was painted in oils on wood panel by Flemish master Jan van Eyck in 1434. Like many famous works of art, it is accompanied by a swarm of scholarly debate and suppositions about its meaning and methods of execution. Much has been written about this painting, by scholars, historians and mathematicians - each trying to unravel the technique and meaning of elements depicted. A famous thesis put forward by artist David Hockney and physicist Charles M. Falco states that the stunning detail produced in the painting is due to the use of a camera obscura, an early optical device that allowed images to be projected onto a screen(or painting surface). Falco's page on Art Optics and the Hockney-Falco Thesis is a great read - especially if you like the melding of art and mathematics. The painting is believed to depict Giovanni di Nicolao Arnolfini, an Italian merchant who lived in the Flemish city of Bruges (modern day Holland.) The woman in the picture is commonly held by many(but not all) to be Arnolfini's wife Costanza - whom had died in the previous year (1433). Along with this goes the supposition that Costanza has passed during childbirth - though the documentation(unearthed in Florence) revealing Costanza's death date does not clarify the cause. With this interpretation, the painting is hence a memorial portrait. Another school of thought is that the woman is a second wife, of which no definitive evidence exists. 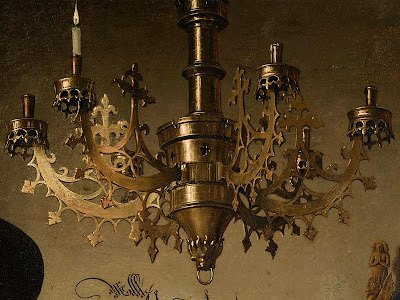 An interesting clue that it is the deceased Constanza (as opposed to another woman) is the detail of the brass chandelier. In it can be seen the commonly used metaphor for untimely death - a snuffed out candle on the side above where the female figure is standing (the one the left.) Other symbols of sacrifice(the passion) and death(fruit on the window sill - referring to the Garden of Eden) are carefully placed to strongly support the 'memorial portrait' theory. The chandelier itself is rendered in amazing detail - Whilst Hockney and Falco once stated that it was painted in 'perfect' perspective, this was later proved incorrect by David Stork using computer imaging technology. A similarly fascinating article about this can be accessed here. It is definitely refreshing to see the amount of science that supports both sides of this debate - not just the wild suppositions of art historians based on whim and bias. I was first introduced to this painting when studying art history. It was used as an example of perspective that was 'close' but not mathematically precise, or at least in accordance with the linear perspective detailed by van Eyck pupil Petrus Christus. This painting is an example of how scientific application of techniques (and perhaps devices), began to produce images of stunning realism. Use of science in image making was a practise resurrected from antiquity - frescoes from Pompeii also show an impressive application of perspective - this practise of fusing art and science continues to this day in the form of computer generated images(CGI) seen in art, cinema and TV. Another curiosity in the van Eyck portrait is the convex mirror at the centre of the painting. 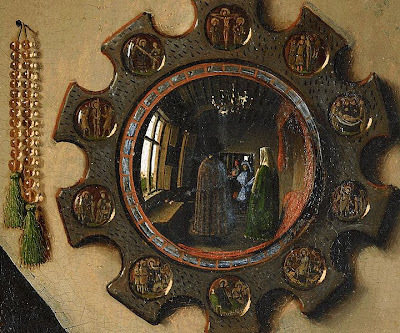 Close inspection shows the stupefyingly intricate details of scenes from The Passion embedded around the mirror. It is widely believed that the convex mirror has been exaggerated in size from mirrors that would have been available at the time. Apart from allowing space for the Passion images to be depicted, this was also done to fit in reflections of two persons in the mirror - one believed to be the artist himself. In doing this, the artist places himself at the centre if the painting's "universe." This is deeply significant for those examining The Renaissance from a social and spiritual perspective. The days of art with Christ or The Virgin as the central figures were definitely not gone yet, but the artist was beginning to insert himself into the picture more frequently - something which became more prevalent with artists such as Michelangelo, Raphael, Tintoretto and later masters such as Velasquez, Vermeer and Rembrandt. The Arnolfini Portrait has, and will continue to be at the centre of speculation and controversy in the art world for centuries to come. As we will find with other works in this series, ground breaking images have a tendency to this. The painting was purchased (some say illegally, as the painting officially belonged to the Spanish Royal Family) by the National Gallery, London for 600 pounds in 1842, and remains there to this day. If you are ever in London, be sure to visit this amazing achievement of art and science. The highly watchable art critic and documentarian, Waldemar Januszczak, did a feature on this portrait in his amazing series Every Painting Tells a Story, available from ZCZ Films directly. Below is a short excerpt.